hurry! this contest for 5 free books ends tomorrow! January O'Neil is giving away 5 titles published by CavanKerry Books. Leave a comment HERE to win them. how can He love me and hate what I am? not desiring to go it alone. The college of cardinals wore punitive red. The white spine waved to me from his white throne. myself, I climbed out, a beast in a crib. Somewhere a terrorist rolled a cigarette. Reason, not faith, would change him. oh my. i've been a bad blogger. yes, yes, yes: i will talk about my reading in nyc soon. i've been so busy this past week. doing what? hmm. let me think. i've been...hmm...working! i'm at the library right now. i'm on lunch break. you wanna know what i ate? sunlight. i ate sunlight. I won week three of the Daily Poem Project! Now, go vote for the fourth week contestants. For the third springtime, I’ve invited poets to tell us about their favorite new books of poetry. This year they picked titles by Richard Jackson, Ted Mathys, Hillel Halkin, Beth Bachmann, Dora Malech, Valzhyna Mort, D.A. Powell, Louise Glück, Kevin Young, John Burnside, Olena Kalytiak Davis, David Blair, John Murillo, Sarah Gambito, Tom Yuill, Heather Hartley, Frannie Lindsay, Douglas Kearney, Maurice Manning, Norman Fischer, Allison Titus, Jason Koo, and Roger Mitchell. Lucille Clifton is known as a poet of simple and clear diction, informed by trickster sensibility, and is as facile with the cadences of King James as she is with Black vernacular. Several years later she and I danced together at AWP in Palm Springs. She loved Moby. She loved wearing her black leather pants and blood-colored jacket. spending my last morning in new york city. i didn't bring my laptop, so i'm at an internet cafe. i had a great time reading last night. more details later. man, i love visiting this city! I have a votive candle next to my bed. The only time I take a match to the wick is when I feel a particularly devastating poet loss. Just a few weeks ago, it held a flame in honor of Lucille Clifton. Just a few days ago, a flame for Ai. My thanks to the editors of Witness. Thanks to John Olivares Espinoza. His poems inspired me to write this one. The poems borrows language from Angela de Hoyos and Américo Paredes. Gracias, maestros. you should check out poetry daily this wednesday. i'm just saying. three poems by henri cole. allergy season is here! my nose is runny and i'm sneezing a lot. have i told you how much i love my new bracelet? it's fab. i should post a pic of it this week. three poems by eduardo c. corral. i'm not like a bird. We snacked together behind the auditorium coat racks and she turned to me and placed her hands on my ever-expanding belly, a gesture that happened all too frequently that last month of my pregnancy from strangers and friends alike. But with “Mama Lucille,” I wasn’t startled. i don't work tomorrow! yeah!! so i got rejected by poetry magazine. a friend told me it probably didn't help that i'd recently made fun of a guy who reviews for the magazine. ha. i'm sure that was not the case. the screener just didn't like the poems i sent. end of story. dora malech: let me explain. i get goosebumps when a poet i adore says nice things about my poems. thank you, d.a. powell. i need to buy a new bracelet for my upcoming reading in the east village. i wave my arms around when i read, and i like to have some bling glittering as i wave my arms like i just don't care. omg. i'm going to read with henri cole. still can't get over that. i just hope i don't say something stupid to him. there's a shop at union square where i've bought bracelets before. i hope they're still open. and yes, i buy bracelets designed for ladies. so what! guy bracelets are all leather and boring. i'm not into leather and i'm not into boring. i've never been kissed in the rain. have you? i really wave my arms around when i read. i become a plane propeller. ...don't sprinkle poop on the ice cream. CantoMundo now has a website! CantoMundo plans to build on the aesthetically, culturally, and linguistically diverse work of Latina/o poets, who have historically—and with limited economic resources—formed supportive literary spaces. This will be done by respecting Latina/o poetry’s stylistic and thematic diversity, while maintaining a vibrant, meaningful connection to a community-grounded readership. Submission guidelines for the Master Poet Craft Workshops are here. This spring, Shenandoah: The Washington and Lee University Review, celebrates one milestone and prepares for another. First comes the 60th anniversary issue of the journal, a tribute to writer Flannery O'Connor. And then comes a change, when Shenandoah shifts from print to Web. Cole's poems are always tragic, always frustrated, but awake to the fleeting moments when something transcendent appears to happen. San Francisco poet D.A. Powell learned in early February that he had won a prestigious $100,000 prize for his most recent book of poems. Only days before, he had received a form rejection letter from the New Yorker for a poem he had submitted. Let's see. Rigoberto González has published two books of poems, a novel, a book of short stories, two children's books, a YA novel, and now he's edited Camino del Sol: Fifteen Years of Latina and Latino Writing, just out from the University of Arizona. 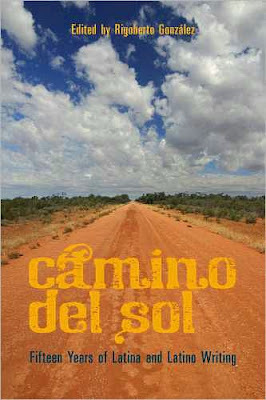 The anthology brings together some of the best writing published by the Camino del Sol series, which publishes books by Latina/os. And he still has the time (!!!) to write a monthly book review column, to be a contributing editor for Poets & Writers Magazine, and to be on the Board of Directors of the National Book Critics Circle. I'm not even mentioning all the flying he does around the country to give readings/ lectures. Or his mentoring. Or his teaching at both a traditional MFA program and a low-residency program. Lord have mercy on the rest of us! For the serious Chicano/Latino author of relevant writing, there is no “art for art’s sake” or the luxury of separating identity from imagination or experience. Such posturing is the indulgence of the privileged---the hobbyist writing of dilettantes and children of leisure disguised as “artistes,” or, more tragically, the insecure scribblings of delusional writers of color who believe they will transcend their ethnic identities and be hailed simply as “writers.” In this race-conscious society we all inhabit, such wishful thinking remains a fantasy. And did I mention his author photos are taken by Marion Ettlinger? Oops! He's also written a memoir. Criticism of Bishop in her lifetime was mostly appreciative of her powers of observation, her carefully articulated descriptive language, her wit, her intelligence, the individuality of her voice. I want to acknowledge the distinction of all these, the marvelous flexibility and sturdiness of her writing, her lack of self-indulgence, her capacity to write of loss and of time pat without pathos and with precision, as in poems like “Sestina,” “The Moose,” “Filling Station,” “First Death in Nova Scotia,” “At the Fishhouses.” I want to pay this homage and go on to aspects of her work which I have not yet seen discussed. In particular I am concerned with her experience of outsiderhood, closely—though not exclusively—linked with the essential outsiderhood of a lesbian identity; and with how the outsider’s eye enables Bishop to perceive other kinds of outsiders and to identify, or try to identify, with them. I believe she deserves to be read and valued not only for her language and images, or for her personality within the poems, but for the way she locates herself in the world. 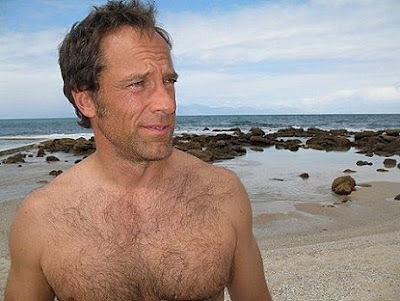 from the Discovery Channel's Dirty Jobs. I hope he doesn't ask me remove him from my hottie list. Ha. And in a fashion of hyper-modern and hyper-post modern gymnastics, there are amazingly other books. Books that do not howl. Books that do not pursue louder music, brighter lights, more flash. More Hopkin’s compression; springier sprung rhythm. Books that have—dare one say it—old world manners . . Established in 1999, this first-book award is dedicated to the discovery of exceptional manuscripts by African American poets. The participation of distinguished judges and prominent literary presses has made this prize highly competitive. Winner receives $1,000, publication by The University of Georgia Press in fall 2011, 15 copies of the book and a feature reading. i can't wait to go back to nyc. i'm already having dreams about walking around the village, of buying books at st. mark's bookstore, of eating a slice of ray's pizza, of hailing a taxi. if you live in nyc, i would love to see you at the reading. i know life is busy in nyc, but it would be great to see a few friendly faces in the audience. i'm a bit nervous about reading with henri cole and david gewanter. why am i nervous? did you read those bios??? ha. i'm looking to try new restaurants in the village and union square area. so if you have a place that you love, let me know. hmm. i'm not being very bitchy in this post. my apologies. i can't wait to sit on a bench, eat a hot dog and people watch. oh, central park! hey corn shake, should i get some pinkberry? March 22, 2010, 7 p.m.
Join us for a great reading by Henri Cole, David Gewanter, and Eduardo C. Corral. We are also celebrating the highly anticipated selected poems, Pierce the Skin, by Henri Cole, and the new book, War Bird, by David Gewanter. Henri Cole's selected poems, Pierce the Skin, published in March 2010, brings together poems from the past twenty-five years, including work from early virtuosic books, long out of print, as well as his more recent books, Middle Earth (2003), winner of the Kingsley Tufts Poetry Prize and a Pulitzer prize finalist, and Blackbird and Wolf (2007), winner of the Lenore Marshall Poetry Prize and the Lambda Literary Award. His numerous other awards include a Guggenheim fellowship, the Rome Prize, two National Endowment of The Arts fellowships, and a United States Artist Fellowship. He lives in Boston and teaches at Ohio State University in Columbus. David Gewanter is author of three poetry books: War Bird, just out from U. Chicago Press; The Sleep of Reason(Chicago, 2003), finalist for the James Laughlin prize; and In the Belly (Chicago, 1997), awarded the John Zacharis First Book award. He is co-editor, with Frank Bidart, of Robert Lowell: Collected Poems (FSG; Faber, 2003), winner of an Ambassador Book Award (English-Speaking Union–US), and named “Book of the Year” (Contemporary Poetry Review). The recipient of a Witter Bynner fellowship, a Whiting Foundation Writer’s award, and a Hopwood award, he teaches at Georgetown and lives in Washington DC. Eduardo C. Corral holds degrees from ASU and the Iowa Writers' Workshop. His poems are featured in a Web Del Sol chapbook. His work has appeared in Ploughshares, Poetry Northwest, Post Road, The Nation, and Verse Daily. He's the interview editor for Boxcar Poetry Review. His work has been honored with a "Discovery"/The Nation award and residencies from The MacDowell Colony and Yaddo. He was the Olive B. O'Connor Fellow in Creative Writing at Colgate University in 2007/08. In the fall of 2008 he was the Philip Roth Resident in Creative Writing at Bucknell University. Just after Sept. 11, Clifton spoke with NPR's Susan Stamberg: "After the event, people turned to poetry," Clifton remarked. "They realized instinctively that there is something here that helps us with our insides." Here's a broad generalization or two. American poets tend to be inclined to go through the self to get to the world; that is, we're not automatically embarrassed to take up space on the page with evocations of our own feelings or experiences. We may be less likely to think of ourselved as representative citizens, or as persons shaped by historical forces. We don't necessarily regard the self ironically.